Easy, healthy, crispy, cheesy and delicious Gluten-Free Mixed Green Quinoa Cakes! 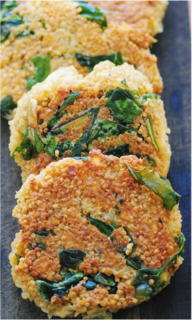 These savory quinoa cakes are easy to prepare & incredibly filling! In a large mixing bowl, combine all of the above ingredients, stirring until all is evenly mixed.Heat a skillet over medium heat & coat with coconut oil. Using ice cream scoop sized dollops, shape batter into patties with your hands & cook 5 minutes each side or until desired golden crispiness.Let cool a few minutes before serving. Great on its own, or with a favorite condiment!Enjoy!